Songs and Suds is a fun karaoke-themed event at Pitch West benefiting the Merrymakers Association. Your support of this event directly helps us maintain and expand our mission to provide free musical entertainment to senior communities throughout Nebraska and in western and central Iowa. Tickets include hors d’oeuvres and open bar. Underwriting support provided by Health Care Information Systems. Join us for an evening of toasting two celebrated community leaders! Eldora and Jack are the founders of Vetter Senior Living. Humorous emcee Mary Maxwell will lead the evening, starting with a cocktail hour and live entertainment by Merrymakers musicians. Following the program will be the Adopt-A-Home Auction to support monthly professional musical entertainment to facilities across Nebraska and in western and central Iowa. Songs and Suds is a fun karaoke-themed event at Pitch West benefiting the Merrymakers Association. Your support of this event directly helps us maintain and expand our mission to provide free musical entertainment to senior communities throughout Nebraska and in western and central Iowa. Tickets include food and drink. Attend and meet some of our talented Merrymakers performers! It’s time for Omaha Gives! Please schedule your donation today! A friendly reminder that Omaha Gives 2017 is underway. You can schedule your donation starting TODAY! The Merrymakers Board of Directors has set up a matching fund to match donations up to a certain amount. Your gift could be worth double! Please consider making a gift today. Use this handy link: http://omahagives.org/merrymakers. Join us in honoring former U.S. 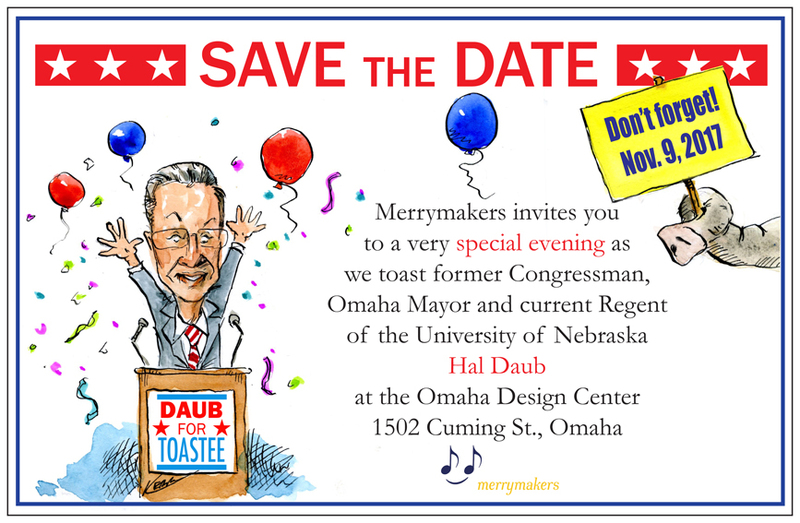 Congressman, Omaha Mayor and current University of Nebraska Regent Hal Daub! Enjoy cocktails, the Merrymakers musicians, emcee Mary Maxwell and a program of toasting Hal by his good friends! All this while supporting Merrymakers Association. When you support Merrymakers, you support live music, seniors, and life in your community! We are writing to announce that Patti Craig is no longer with Merrymakers Association. We thank Patti for her years of service and we wish her the best in her future endeavors. We are excited to announce that Sandy Lemke will be serving as our interim Executive Director! If you have additional questions, please contact Board President Dave Mayer at dmayer@ddlawgroup.com or Sandy at sandy@merrymakers.org. The Power of Music to Spark Memory. Join us for a fun casual event at the Old Mattress Factory with DJ Howie! Borsheim’s Fine Jewelry and Gifts has donated a necklace for a lucky raffle ticket buyer! Honorary Chairs are Tom and Mary Kerr. Admission includes food and drink.